materials to sell. UMNS photos by Clay Kisker. Fires fill the air with toxic fumes. Flies cover rotting hoofs of cattle. Vultures surround a pond of murky water waiting for a weak, malnourished dog to die. 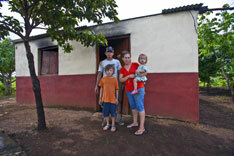 For 175 families, the Chureca refuse dump is also called home. 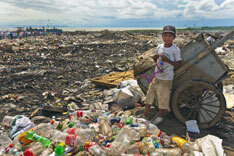 More than 2,000 people comb the garbage daily for food or recyclable materials to sell for less than a dollar a day. Each time a truck dumps fresh waste, a swarm of humanity descends with makeshift picks and aggression. The dump is sustaining them and killing them. More than half of the children born here will die before age 6, according to some estimates. It is into this place – named one of the 20 horrors of the modern world by the Spanish magazine “Interviu” in December 2007 – that United Methodists have come to help offer a way out. Started six years ago by United Methodist missionary Cheryl Avery, Project Chacocente moved eight families to fertile farmland in Masaya, about 20 miles southeast of Managua. 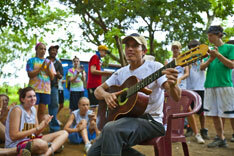 Nelson Ortiz is proud of his crops and his new life after 25 years in the dump. “When I was in Chureca, I was very sad because I no eat every day. My son no drink milk. Now in Chacocente, my family eating lunch, dinner, breakfast. I study. My children study. My wife, she make bracelets, hammock. I feel very, very happy,” he says. Ortiz earned his high school diploma and sold five roosters to buy the guitar he plays for visitors. The success stories are made possible through the partnership of residents and the ministry. At Chacocente, residents sign a contract to work for the project for five years, raising crops to support the community, building their homes, furthering their education and learning crafts and trades. Upon graduation, the families own a house, two acres of land and a self-sustaining lifestyle. One goal is to help families open a small business before they go out on their own. A dozen students jump up and scream the answer in Spanish. Elementary students treasure the chance to learn English, art and music at the private school on the grounds. Teenagers attend a public high school within biking distance. at his home in Masaya. Also feeling good are volunteers from the United States like the youth group from Christ United Methodist Church in Bethel Park, Pa., that visited in July. The 66 United Methodist Volunteers in Mission helped weed and plant crops, lay floors for the school kitchen and auditorium and build additions on two homes. “It’s really interesting to work side by side with them because there’s a huge communication barrier, but with gestures, laughter and smiles, we can get the work done,” says Maeve Kirby, a youth group member. Gregg Stierheim, the youth director at Christ United Methodist, chose Project Chacocente to support because of its goal of self-sufficiency. “It aims to end poverty. You can give someone that’s hungry something to feed them, but that doesn’t solve the problem. Just as without education, poverty is tough to eradicate,” he says. *Kisker is a freelance writer and producer in Pittsburgh.